Optional fabric: PE (Polyester), PP (Polypropylene), PA (Nylon), Aramid(Nomex), Acrylic, Fiberglass, PPS, PTFE, P84 and etc. Everspring Filmedia Group continually raises the bar in bag filter technology. Providing a wide range of bag filters for any bag house collector, which improve the performance, efficiency and bottom line of your bag house dust collector and flue gas bag .Our ring of the filter bag also can be chosen, spring ring,stainless steel. Ask for free sample or trial order, please click here. Asphalt – Durable construction required for abrasive, high temp environments. Hotmix or batch plants, whether natural gas, waste oil, fuel oil, etc. 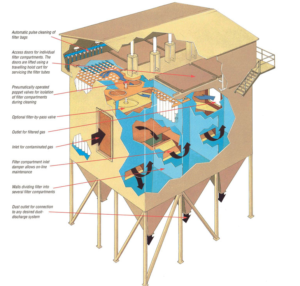 Cement – Filters for all areas of plant: kilns bag houses, silo bin vents, nuisance dust collection, etc. Our filters exceed all EPA emissions standards (NESHAP, CMAT, MACT for portland cement, PM2.5, etc.). Chemical – Filter fabrics for acidic or alkali compounds, corrosive or abrasive elements, etc. (lime, calc, fertilizer, plastics, etc.) – Special treatments and fabrics available. We can advise on the best combination for performance and cost. Food Processing – FDA approved food-grade fabrics construction available for dust collectors used in food production, transportation and packaging such as dust collectors on milling equipment, blenders, mixers, granulators, grain elevators, storage silos and more. Foundry and Metal Products – Filters for units used on arc/induction furnaces, casting operations, and precious metal reclamation. Fabrics and coatings for use in high temperature environments with need for high efficiency fume and smoke collection. Power Generation and Industrial Boilers – Our filters exceed new EPA emissions regulations for boilers and power generation (Mercury and Air Toxics, Boiler MACT, NESHAPs, etc.). We have much experience working with biomass and coal power production facilities to overcome technical challenges to meet new EPA regulations. Filter fabrics and treatments include PPS, P84, PTFE/Teflon (fabric), fiberglass, and ePTFE membrane. Wood, Sand and Minerals – Often requires filters with flame resistant coatings, or constructed from nonflammable materials. Choosing the correct bag house filter will maximize performance, increase filter life, reduce system downtime and save your money. With so many different types of bag house filter fabrics and treatments options to choose from, it’s important to know which is the best fit for your specific application. Filmedia Everspring provides our customers with solutions not just the same old filters over and over again, but provides you with a free technical analysis and consultation to ensure you are getting the most out of your dust collector filters. 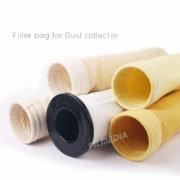 The filter bags we supply are specifically refers to a parts for industry filtration. We can produce more than the following products and the our products’ feature and size is customizable. Feel free to send us email, With 6 years experience, we will meet and satisfy your needs no matter how unusual your requirment is. We have professional article about how to choose the filter media according your practical application, which can give you some suggestions. If necessary , our engineers will give you more specialized advice. Filmedia provide the complete range of filter bags for your bag house and dust collection system in a wide variety of fabrics, finishes, styles and sizes.